"@ricky_martin got his start as a member of the Puerto Rican boy band Menudo and, at 43, is still an exultantly boyish trouper — a song-and-dance man who keeps his music up-to-date for Latin pop radio, and who smiles his way through electronic beats, hard rock, lovelorn ballads and carnival-ready Caribbean rhythms. In February, @ricky_martin released his 10th studio album, "A Quién Quiera Escuchar" ("For Those Who Want to Listen"). 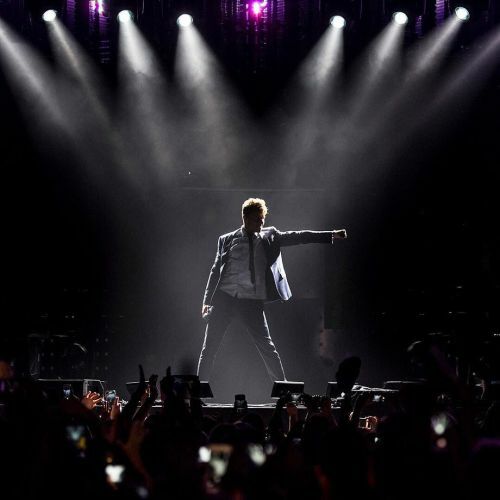 @chadbatka took this photo of @ricky_martin performing at @madisonsquaregarden last night, a stop on the "One World" international tour that he's been on since last fall." By nytimes on Instagram.